A rescue has taken place after a man was found in the water at Ayr Harbour. The coastguard said the casualty was rescued by a Royal Navy helicopter after reports of someone in difficulty in the water at about 12:35. An RNLI lifeboat from Troon was also called to the scene. The man had entered the water by the New Bridge. 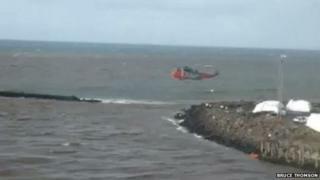 The man was taken to Ayr Hospital after being winched off the rocks. His condition is not known.